David Fichter (Scenic and Puppetry Designer and Painter), Will Cabell (Assistant Designer, Puppet Master), Leslie Held (Costume Designer), Karen Perlow (Lighting Designer), Talia Lefton (Properties Designer and Coordinator), Kareen Roustom (Composer and Sound Designer), Judith Chaffee (Choreographer and Movement), Yahdat Yeganeh (Assistant to the Director), Dominuque D. Burford (Stage Manager), Brian Cummins (Assistant Stage Manager). A colorful and lively rendition of the classic, artfully written and skillfully staged, appealing to both adults and children. The King of Persia, Shahrayar, has been betrayed by his wife and becomes tragically disillusioned. He not only has her executed, but proceeds, in serial fashion, to take new wives daily and have them each executed on the morning following the first, and only, night of marriage. Shahrazad (more familiarly, Scheherezade), the daughter of the king’s vizier, with a plan in mind to save other women from being subjected to the king’s vengefulness, convinces her father to let her marry the king. The plan involves seducing the king with a series of stories, leaving each one sufficiently unfinished at night so that he will be compelled to keep her alive through each following day to complete it. 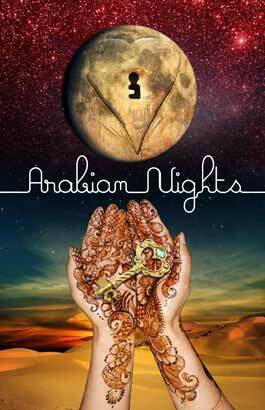 The plan succeeds and Shahrazad transfixes Shahrayar for one thousand and one successive nights with her exotic tales. At that point, the king finally seems to learn something. The current production – the first-ever cooperative theatrical endeavor of the two companies which share the Central Square Theater – The Nora Theatre Company and The Underground Railway Theater – is an inspired combination of storytelling and inventive staging. In two and a half hours, this production beautifully and adeptly depicts the narrative core and conveys the wisdom and spirit of this classic collection of tales. The adaptation is expertly done, so that the full trajectory of the drama between the king and Shahrazad is clearly outlined with considerable dramatic buildup along the way. And the tales are told wonderfully. The thematic complexity and ebullience of each is vividly rendered, and some of them go on for quite awhile. And, there are, in total, quite a number of tales, but they are all delivered entertainingly and with theatrical inventiveness. The staging is superbly conceived, representing an inspired combination of prop wizardry, puppetry and choreography. The standing set is simple: mostly an ornately painted floor representing a patchwork of oriental rug patterns. But magic unfolds upon it: the cast persuasively creates the illusion of a group of horses galloping on a road, or, by inverting its capes suddenly, conjures up the glow of Ali Baba’s discovered treasure. 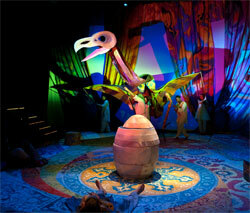 There is a fabulous, huge, bird puppet, integrated artfully, manipulated gracefully. (It is reminiscent of Julie Taymor’s innovative puppetry technique seen years ago at the American Repertory Theatre in The King Stag, and later, on Broadway, in The Lion King). The design and technique here, in Arabian Nights, is fabulous. The acting is good all around, indicating, as well, expert directing. Evelyn Howe as Shahrazad (and other roles), has a deep, rich, somewhat gravelly voice, transfixing and seductive. She conveys the moral fiber, the inventiveness, the daring, and the earthiness of the character in a compelling way. Paige Clark as Shahrazad’s sister, Dinarzad (and other roles), is delightfully forceful and gracefully direct, wonderfully complementing Shahrazad. Vencent E. Siders (Shahrayar, etc.) is a boisterously compelling king, artfully combining insolence and vulnerability. The other members of the cast – Alexander Cook (Vizier, etc), Debra Wise, Ramona Lisa Alexander, Elbert Joseph, Ahmad Maksoud and Inbrahim Miari, are all very good in their own unique ways. This is story theatre at its best. 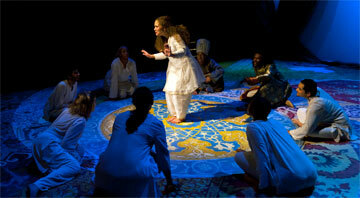 The audience consisted mostly of adults, but there were children as well, and the production played well to all. Entertaining, colorful, imaginatively staged in a way that corroborated the urgently necessary inventiveness of the protagonist, it was truly a delight.